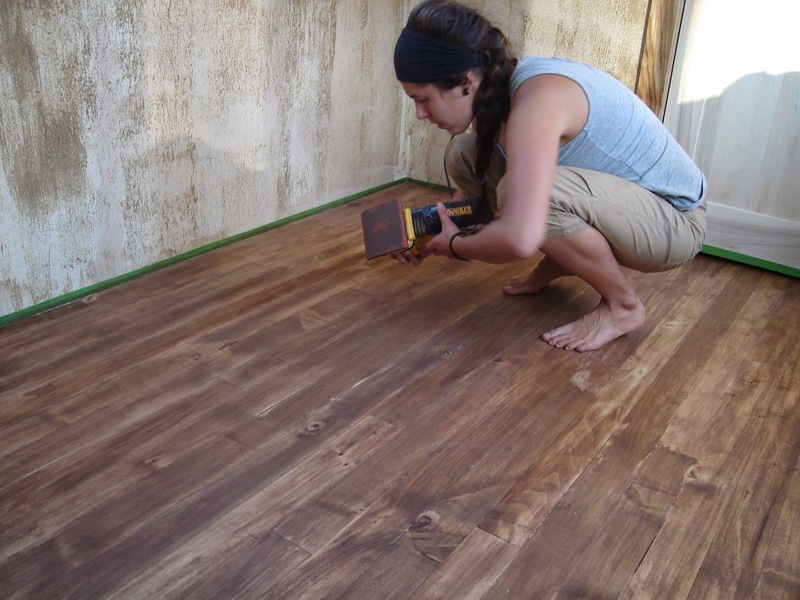 Alex used natural milk paint pigments from Homestead House to stain the poplar floors and stairs in my tiny house. These pigments were extremely difficult to work with and I did not end up liking the result. But I have a few tips on how to get a better result. The first tip is you can not go too many shades darker with these pigments. You can go one or two shades darker at most. Here you can see what happened when we stained the very light popular floor dark brown. It turned out very patchy and uneven. (Partly this was due to a soft wood and the way poplar absorbs things, but I think it would come out uneven on any type of wood). We had to go back over the floors and sand part of it off. Then go in by hand and sand the darker bits. It still isn't where I want it to be. Applying the stain is also a difficult procedure. If you just paint it on with a paintbrush or with a cloth it will go on even more blotchy than this, and you will see all the brush lines. or lines from the cloth, because it dries in a few seconds. 1. Tape off the wood along the seams in 3 or 4 inch sections length-wise. Do not tape it off width-wise or you will have a dark looking seam there. 3. One person paints on the stain with a brush and keeps moving down the length without stopping because it dries in a few seconds and you will have marks of where you stop if you stop. Overlapping the stain will also leave a noticeable splotch. 4. The second person follows, rubs in the stain/removes the excess with a cloth to even it out. This has to all be done very fast. On top of the stain we put hemp oil. The picture on the right is grime from the landing floor. This is just hemp oil with no stain. It does wipe off with a cloth. If you just want a slightly enriched look I still like hemp oil as a top choice. But if you want to stain the floor a different colour I would not use these pigments. There are so many better options for wood stains that are easy to source since 2014 when I did these floors. Here is my post on stains and sealers. I love the color on the floors. I also love the idea of using popular due to its light weight. I don't have a VOC allergy so do you think it would come out even without the blotches, lines, etc if I used a wood conditioner first? Not sure. You would have to test it. I like floors and stair planning in this House Design. It's taken a few spaces for stairs. I have discovered a much easier way to stain with milk paint. I applied one coat of hemp oil to my pine floors and then I mixed the milk paint to make a stain by mixing it 1 part paint to 3 parts hemp oil. This makes applying the stain very easy. I worked plank by plank and brushed the tinted oil on the wood then used a cloth to rub it in and then sanded with a fine sandpaper and then wiped of the excess. Because it is being applied over one coat of hemp oil overlapping is not an issue and the colour is even and very easy to manipulate. I applied a beeswax and hemp oil polish over that and buffed. thank you, that was what I was going to try, but homestead house said they no longer recommend that method. However it sounds like it worked bette than my water method. How is it holding up? I just tried this on poplar and soft maple with three samples I got from The Real Milk Paint Co. I liked that I didn't react to the hemp oil or paint, but I didn't like how splotchy it turned out. It's not horrible, but I'm probably just going to use hemp oil. Hey there! 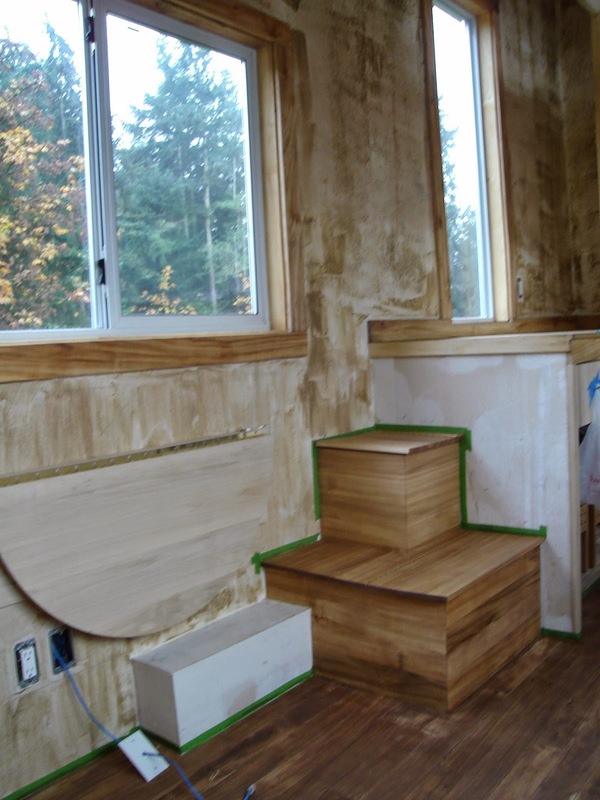 Could you possibly write in depth about how you built your flooring to avoid mold? Is there a particular method you used? We're going to go with a steel frame, but I'm terrified of mold issues developing in the wooden sub floor. 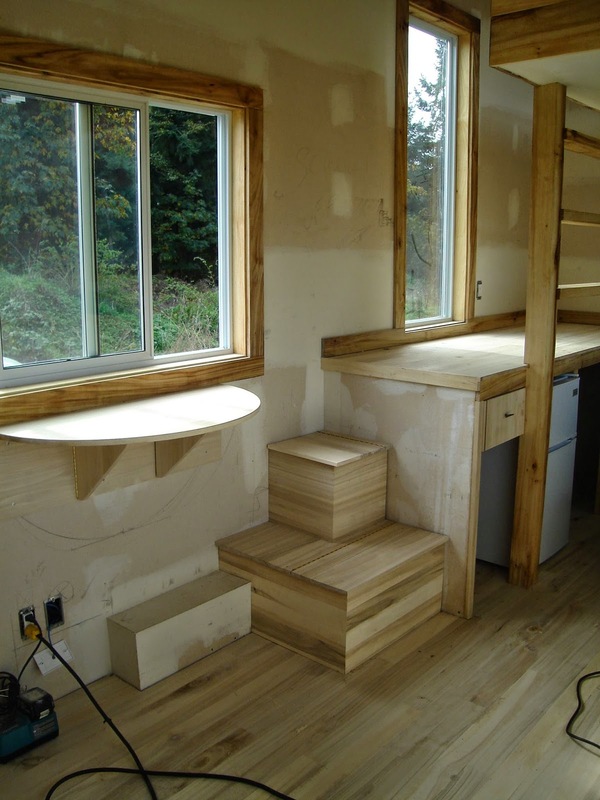 See the post on Passive House Tiny House for ideas on that. The floor of a trailer is really tricky. I would consult an architect.